Nantucket basket. 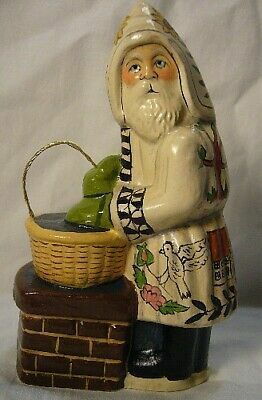 Judi Vaillancourt has depicted this Santa on the rooftop putting a highly detailed Nantucket basket into the chimney. His coat, with the utmost embroidery and illustrative detail is based off of the romantic and nostalgic images on an exquisitely engraved polychrome whalebone box that was researched within the Nantucket Historical Association. It is personally signed by Judi and wonderfully painted by the Vaillancourt Artists. It measures 4 1/2 inches and in perfect condition.